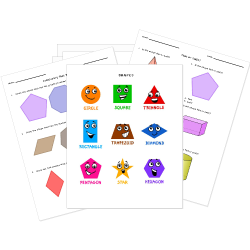 Use these shapes worksheets to help younger students recognize and describe two-dimensional and three-dimensional shapes and older students reason with more complex shapes. Don't see a printable you need? Use our Test Maker™ to create your own printable that fits your needs. Browse basic shapes questions or use our advanced search to find existing questions while filtering by grade levels and keywords. Use this collection of nets for hands-on construction activities by printing directly onto paper or card stock. Nets are in printer-friendly black-and-white, elementary students enjoy coloring the nets before constructing them!